Local Fort Collins Cidery, Summit Hard Cider and Perry Company, LLC, has been awarded a $150,000 implementation grant from the Local Foods Promotion Program, a USDA-funded service. The project, descriptively titled “Apples by the Community, for the Community: Turning Fruit Waste in Northern Colorado into a Viable Income Stream, Food Source, Educational Tool, and Locally Sustained Product” aims to do just that. A large portion of the funds will be used for the purchase of a mobile apple processing trailer. This impressive apple press on wheels has the ability to wash and subsequently mill, press, pasteurize, and bottle underutilized fruit from local communities and farms into fresh juice, providing local fruit producers with a value-added product and additional income stream. The grant funds will also be used to help local fruit producers enhance the productivity and quality of local fruit trees and orchards through pruning workshops and trials. Finally, the grant will strive to increase agritourism and public awareness by having a presence at local events such as farmer’s markets and festivals. 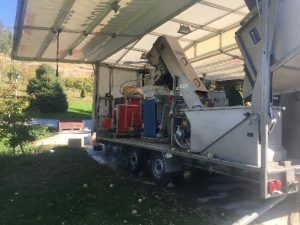 Under this ground breaking project, producers will be able to take their culled fruit- fruit that does not have market value for fresh eating- and get it processed, either as bulk juice which can be sold to cideries or juice companies, or as 1.5, 3, or 5 liter bag-in-box containers which can then be sold by the producer to retail markets. The aim is to increase the income of these producers by providing an affordable and convenient way to process their unused fruit into a value-added product. The project will also offer hands-on tree care in an attempt to revitalize Northern Colorado fruit orchards. Drawing on volunteer resources from Colorado State University and community programs, grant funds will be used to assist producers or land owners prune at least 400 trees per year for the next three years in order to improve overall yields, tree health, and maintain the unique genetic diversity of Northern Colorado heirloom apple varieties. Lastly, by bringing the mobile fruit processing trailer to markets and festivals across the state, the program will increase public awareness of local foods and encourage communities across urban and suburban areas to process the fruit from their neighborhood trees into juice for the community. The overarching goal of the grant, inspired by the mission and purpose of the original Branch Out Cider Community Orchard program, is to increase awareness of local food production by providing individuals with an active role in bringing their fruit from tree to table. “We are thrilled and honored to be involved in this exciting and innovative project that will benefit our community,” comments Lucas Thompson, harvest manager and cidermaker for Branch Out Cider and Summit Hard Cider. “We intend to be good stewards of these federal funds and are confident in our ability to reach and exceed the objectives outlined in the grant.” Thompson, along with Jennifer Seiwald, owner of Summit Hard Cider, will be spearheading this effort and welcome any questions, comments, or ideas for connecting with those interested across Colorado. Lucas or Jennifer can both be reached at summmitmobilejuicing@gmail.com.